In this section you can find our range of standalone 60mm auto gauges & also daisy chain gauges that can be used in conjunction with our multi gauge, we have tried to cover the range of different gauges people are looking for, such as boost, oil temp, water temp, oil pressure, EGT and more. 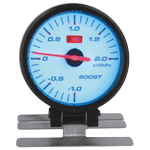 We have a simple philosophy with the gauges we stock, first is the gauge itself needs to be decent quality, second and most important and often overlooked is the sensors also need to be high quality and accurate. A lot of people just buy a gauge on its looks alone, yet overlook the most important factor which is the sensor itself. Now there are plenty of great gauges on the market with great sensors, but these usually come with a pretty hefty price tag and sensors that have accuracy that’s well beyond anything that’s actually required in the real world and this adds to the cost. Then on the other end of the scale are gauges that are cheap and their sensors are terrible. Our aim is to provide a range of gauges at competitive prices, but also have sensors with great accuracy that don’t go beyond real world conditions so as to keep the cost down. Here we have a digital 60mm Air Fuel Ratio gauge, this gauge is intended to be used in conjunction w..